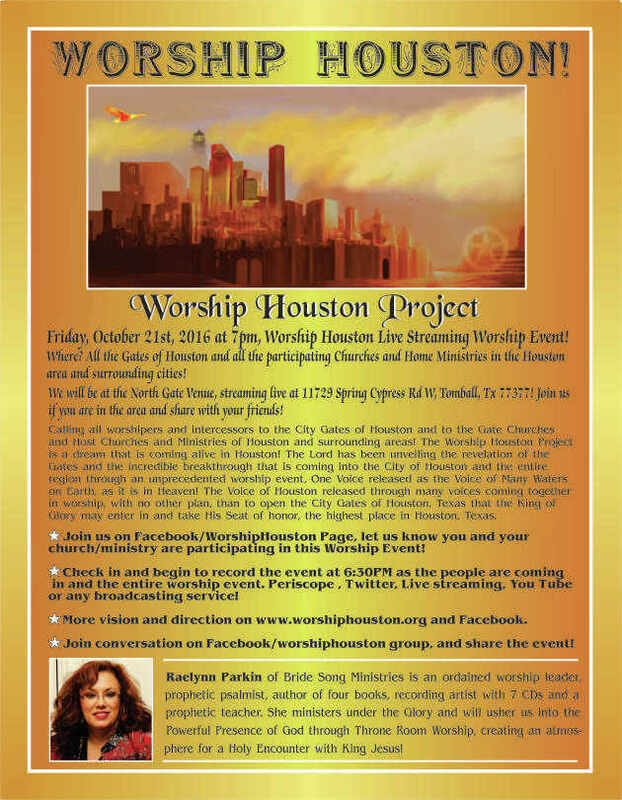 Join us for this live streaming event around Houston and Live Stream with Founder of Worship Houston Project, Dr. Raelynn S. Parkin and her team as well as other participating worship ministries! Please call your sister churches and churches in your community and affiliation and help them connect to the vision and participate as well. Believers, call your pastors and ministry and worship leaders and let them know and get connected to this massive Worship event in your area! Prepare your hearts in prayer, bathe your Worship Houston event in your church and in the Houston area. Friday, October 21st at 6:30pm, begin to check into to Facebook, Worship Houston and to your church and home sites and begin to stream your worship event through Facebook, periscope live or record your service to post to YouTube or any other streaming service. We want to not only document this worship event, in the attendance of the participating churches and ministries and people of our city and region. The vision and the mission of the Worship Houston Project is also to release a Sound and a worship in Houston that allows Heaven to be released in the earth and the Shekinah Glory of God to find Houston as a Habitation and a Lighthouse to America! We want to see the prophetic Destiny of Houston be fulfilled not through one voice, but through many voices and to release the Clarion Call of Houston and its people to this nation and to the world, to let the Light of His Glory so resonate in Houston, and to send forth that Light to dispel the darkness that is trying to invade our cities, communities, our nation and our world! This is the Hour for the Church to Arise, to no longer be silent, but to be heard, and that the Holy Spirit will be released as in Joel 2 and as in Acts upon all flesh, every man, woman, and child! ​See you at Worship Houston!